Tubey Toys Review: New Toy Fair 2019 Just Play Toys Disney Junior Toys Puppy Dog Pals, TOTS Rescue, Minnie Mouse, JoJo, Ryan's World and more for Fall 2019! 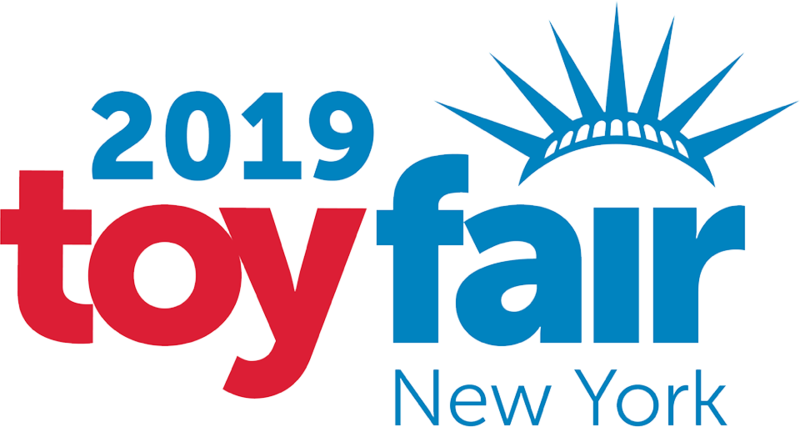 New Toy Fair 2019 Just Play Toys Disney Junior Toys Puppy Dog Pals, TOTS Rescue, Minnie Mouse, JoJo, Ryan's World and more for Fall 2019! Just Play Toys never disappoints with their wide range of toys that includes so many of our personal favorites! Just Play Toys’ ability to create and innovate interactive play-sets, poseable figures, poseable dolls, vehicles, surprise toys and more allows for so many fans of different characters and shows to be able to recreate their favorite scenes and more. Check out our video coverage at New York Toy Fair 2019! Based on the upcoming special on Disney Junior, the T.O.T.S. Nurser Headquarters Playset has a variety of ways to play! Slide down the cloud slide through sky tunnel, brings the babies up to the next level in the stork bundle elevator, take a nap on a cloud, or get pushed around in a cloud stroller — all of the tots waiting for loving homes live comfortably at the nursery headquarters. This set is $39.99 for ages three and up and will be available in the fall. There will also be a T.O.T.S figure set, T.O.T.S. Surprise Nursery Babies mystery bundles with color change diapers, T.O.T.S. Surprise Babies Nursery Care Set, Plush Babies, and even larger carriers with grooming kits for pretend play! Supposedly this is just a one-off special, but for such a huge launch of toys, I can only imagine that this will become the cutest series next to Puppy Dog Pals! Speaking of Puppy Dog Pals! We met cute puppy Keia in season two, and Bob created an amazing treehouse for her in the second episode of the season! Now, Keia gets her own treehouse play-set for us to enjoy at home! No house parties please, I don’t think ARF can fix the treehouse twice! 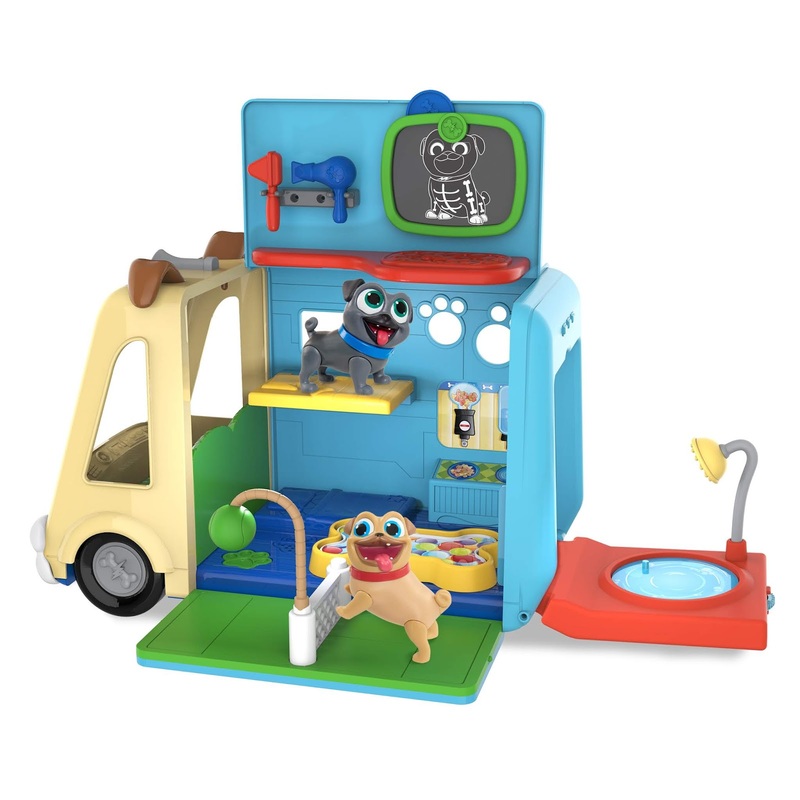 This set looks even cooler than the pups’ treehouse play-set from the initial release, plus it’s a bit smaller, which is something I appreciate! More retail info on that set coming soon. Bingo and Rolly can get checked out on the go with the Awesome Care Bus Set. The bus opens up to reveal a play area, a puppy bath, a place to get check-ups, X-rayed, groomed and more! With lights and sounds, realistic vehicle movements, plus you get two 3” figures, Bingo and Rally! Coming this fall for ages three and up for $34.99. We also noticed a new deluxe play-set with a new pup, and a new robot! Last year the deluxe set included Keia around the summer of 2018, and it was $19.99 as a Target Exclusive. This time around, it includes Keia’s pal, Chloe, who is also the pups’ neighbor, a mystery dog, and a robot. 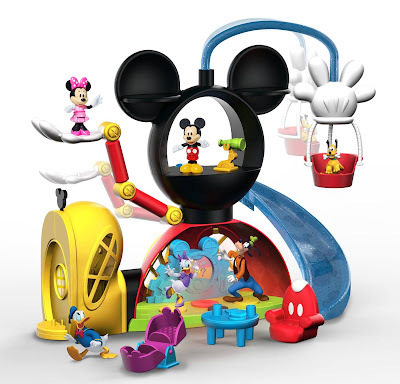 Mickey Mouse is getting a brand new clubhouse! The Mickey Mouse and Friends Clubhouse Adventures play-set is a multilevel play-set with different components to explore. Start from the top of the clubhouse and take a ride on the Mickey glove hot air balloon. When you’re done, take walk on over to the telescope and peruse the beauty and majesty of Hotdog Hills. Slide down the slide to the first level, or take the handy helper lift down to the first floor. On the main floor, press the floor to activate a series of familiar sounds and lights. This set comes with 3” Mickey and Minnie Mouse figures. It comes with a bunch of accessories too like a telescope, one play table, chair, and more! Available this fall for $34.99 and for ages three and up! There will also be a deluxe set of figures including an excessive red Mickey Mouse figure, and even Pete! Minnie Mouse is getting a jazzed up bowtastic home in her new and spiffy Bowfabulous Home. Like a shiny beacon at the top of the two story home is a polka dot bow that twinkles in rainbow colors and plays familiar sounds. Step on the doormat to “open” the door, and once inside you’ll feel like you have stepped inside Minnie’s fa-bow-lous home! Take the manual elevator up to the second floor and get a tour of the top floor, once done slide down the slide and have a snack at the dining table. 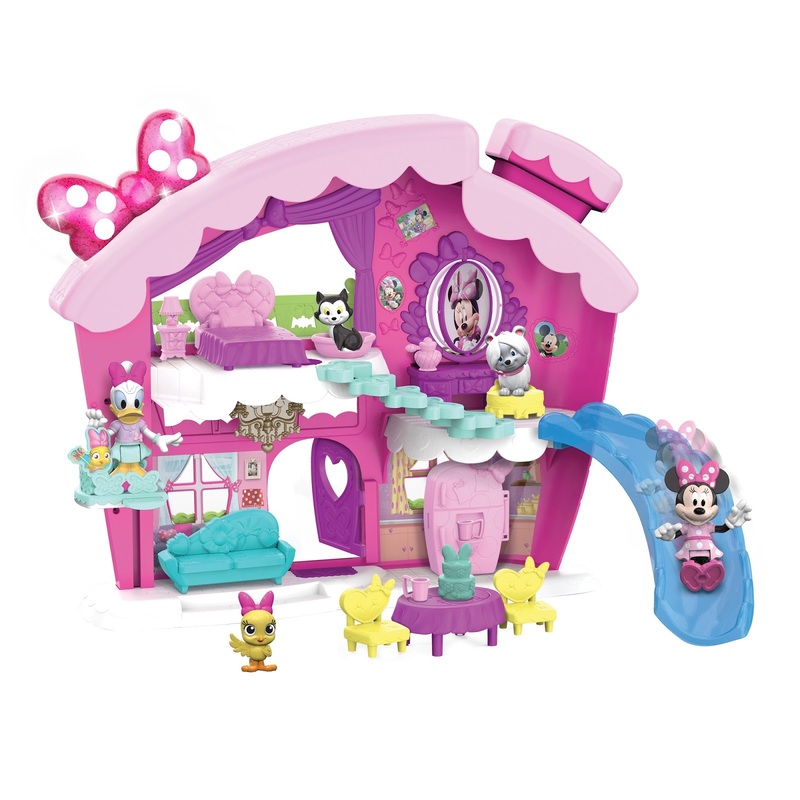 There is so much included with this set like articulated Minnie Mouse and Daisy, Figaro the cat, and furniture and accessories to help make happy helping a breeze. Available this fall for $34.99 for ages three and up. We also noticed the a surprise Minnie head with bow and two Minnie Mouse figures. This is just like the Mickey Mouse version. There will also be a plane, the Bowliner Jet. It looks like either Minnie is a flight attendant or passenger. The top flips open for easy play. More info about that set soon! Minnie Mouse fans and unicorn believers will love this cute plush set, Minnie’s Walk & Dance Unicorn Plush! Minnie is hanging out with her new unicorn friend from Minnie’s Bowtoons, Penelope. Pressing Minnie’s hand will activate Penelope to dance. If you have them touch, they will walk together. This is seriously such a cute set! Minnie’s outfit is so sweet with her sparkly and rainbow details on her bow, she’s adorable. For $39.99, grab it this fall before the holiday rush! For ages three and up, every bow-tastic Minnie fan will love this set! Wo-oh-oh! Vampirina! The new Spookleton Castle is definitely something to scream with de-fright over! With two stories of ghastly fair from performing on stage, having a midnight hairy scary snack, getting the batties, dancing with Gregoria, and more fans of the show will delight playing and exploring this play set! Take the grand staircase up and down to explore, or relax in a coffin bed after a full day of playing the spookylele. For ages three and up and for $39.99, this set will make it’s debut this fall! PJ Masks new vehicle is a villain chaser and a caravan all in one! 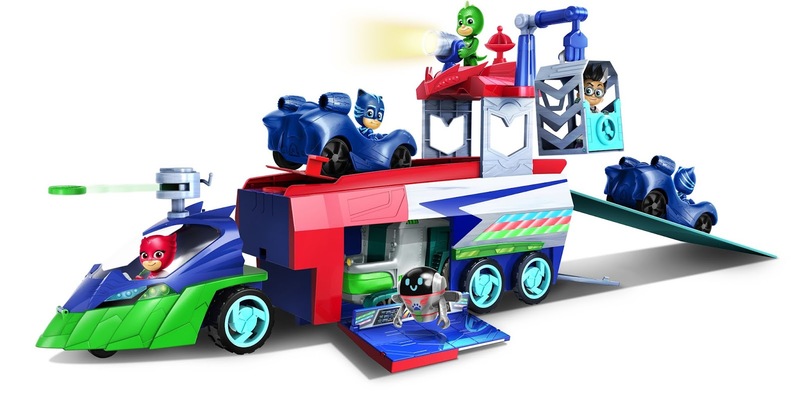 Carry up to four vehicles and three PJ Masks figures inside the new The Seeker! The Seeker crawls the streets in a stealth-like fashion searching for villains on the prowl. Once located with the searchlight, startle them further with a drive-by of discs launched from the disc launcher. trap the villains in the cage. If they get away, with the touch of a button release the Seeker’s cabin and go on hot pursuit. This set comes with a 3” Catboy and a mini Cat Car. Other vehicles with figures sold separately. Available this fall for $59.99, and for ages three and up. JoJo with the bow-bow! Check out the latest poseable doll featuring JoJo D.R.E.A.M. doll where she is singing her hit song of the same name. JoJo’s personality is so vibrant and it definitely shines through within her toy line as well! From top to bottom, she is recognizable as Jojo Siwa with the big, signature bow and super colorful and happy jumpsuit. Have you gotten tickets for JoJo’s D.R.E.A.M. tour? I know my niece is going this summer! Available this fall for $19.99, and for ages six and up, grab this epic doll before the concert and bring her with you to sing along! I also saw JoJo’s D.R.E.A.M. BMW sports car, which is a scaled down replica of her actual car even down to the multicolored rims! Siwanators will also love the mini dolls sold as mystery toy! More details on that soon. JoJo's pup is getting some love too in the form of a plush pet! Stay tuned for that too! Fans of Ryan ToysReview will love the collection that is coming out this fall! 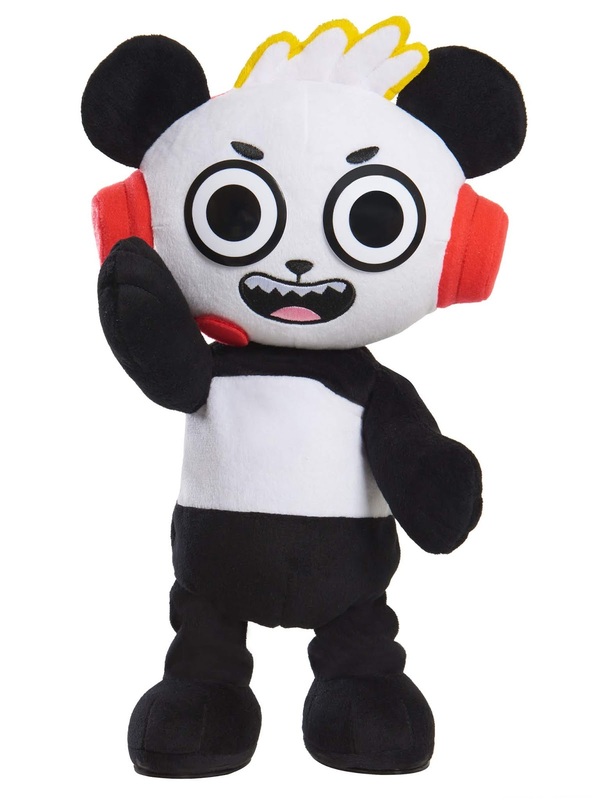 Combo Panda gets his own feature plush, and he talks by saying funny phrases and his headphones light up too! Combo Panda also makes action moves too by pressing him paw! Get him this fall for $29.99 for ages three and up. There are many more toys coming out in the Ryan’s World range. Pizza seems to be a trending thing for Ryan as I saw it in many booths at NYTF. Red Titan will also be have his own mega figure and it incorporates the mystery of finding a surprise figure to the activation of slime! Kids will love Red Titan, which I predict to be a hot selling item. More retail information coming. Another fun item from Ryan’s World will be the surprise boxes with figures inside. Kids have to smash the boxes open with a. Hammer that is provided. I think kids will love that! My favorite dolls Hairdorables are coming back for Series 3 in a whole new way! Now they will come with truly useable accesirues that will actually style and change their hairdo by coloring, crimping, or curling their hair. With new theming, pop-up backgrounds, and fun accessories channeling your inner dancing queen, and outdoorsy woods girl types are super easy! Coming out this fall, they will be $12.99. I cannot wait! Hairdorable Pets Series 2 will match up adorable pets with their owners from Hairdorables Series 2. Included are new accessories, and new finishes on the pets. Available this fall for $7.99 each. Dude! The Dude-meister! Dude-a-riffic! HairDUDEable! What? That’s right! 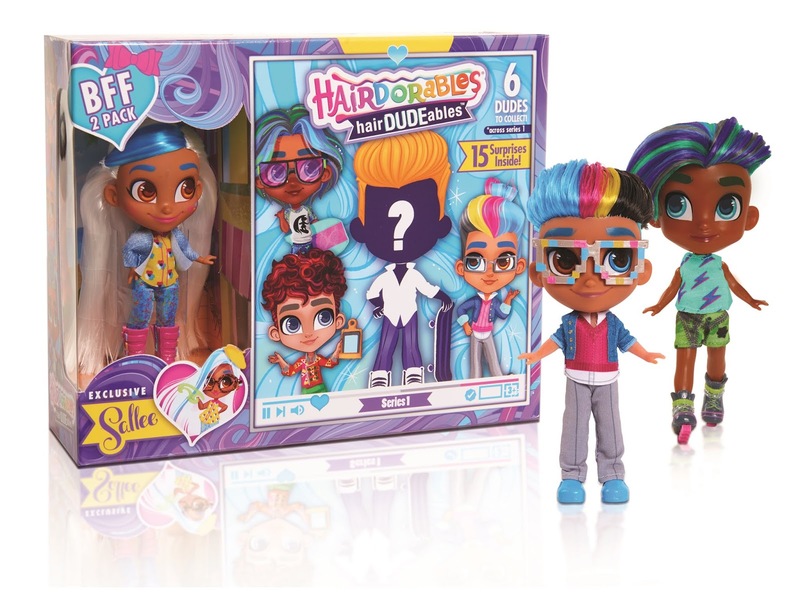 New 2-packs featuring one exclusive Hairdorable doll and one mystery Hairdudeable will be out this fall! The boys are so stinkin’ cute! 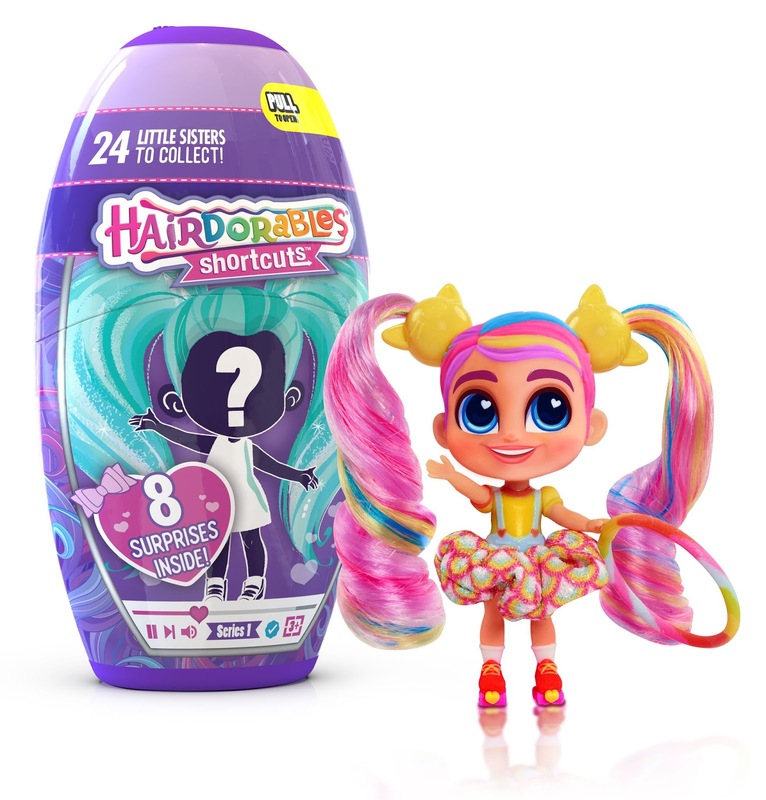 With 15 surprises inside, fun personalities, and accessories, the Hairdorables will have so much fun collaborating on each other’s YouTube channels! Available this fall for $24.99. Move over Hairdorables, little sisters are in town and they’re traveling by shampoo express! Hairdorables Shortcuts are super cute, super sweet, and super short and chic Hairdorables little sisters. Each comes with eight surprises that can be mixed and mingled with the other Shortcuts dolls. You can collect 24 different Shortcuts to realize these amazing transformations. Available for $9.99 in the fall of 2019. 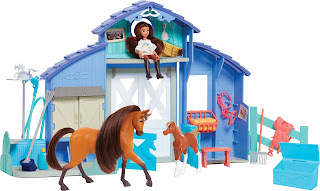 Spirit Riding Free & Lucky Grooming Paddock playset is the perfect place for any horse to get pampered. This set includes a poseable Lucky doll, Spirit, and one foal. Lucky can wash Spirit and the foal, and the continue on their adventures. The set comes with 21 pieces, stickers to decorate the play space, and more! Get this set this fall for $39.99 for ages three and up. Big thank you to Just Play Toys for the amazing tour! It’s always fun hanging out with the people behind such amazing products that bring so much joy and happiness to children, and parents too! Check out our video too, and follow us and subscribe to see even more videos and toy unboxing videos.